After dreaming of following in Dr. Ben Josephson’s footsteps for many years, this January I made my dream come true by joining my life-long friend Hilary Bartels, MD in Guatemala on a week-long journey whose purpose it was to provide medical care to patients in remote villages as well as identify potential surgical candidates that future surgical teams from Faith in Practice would be able to perform life-changing surgery. We travelled over 3 hours to an area known as Suchitepéquez . Our first village, El Progresso, was small in a very wooded area. We set up our clinic in the local school, and had the help of local leaders and teenagers (red-hats) to assist in the running of the clinics. Approximately 600 “invitations” had been distributed to local villagers who were assessed to be in need of medical care each day. Our clinics included a general medical clinic, and pediatric clinic, and gyn/via/cryo clinic, and a dental clinic (whose primary job was to remove teeth which were severely infected or decayed.). We also, for the first time, had a “mobility clinic” where 100 donated wheelchairs were assembled and given to patients assessed to be in need. Finally, our pharmacy staff provided medications that we had brought to distribute to the patients if deemed appropriate by the medical staff. After 2 days at the first village, we moved and set up our clinics at the second village in San Francisco Zapotitlan. As with the first clinic, we cared for poor Guatemalan patients of all ages in the local school. This village was a bit bigger than the first, but the people were no less in need of medical care. 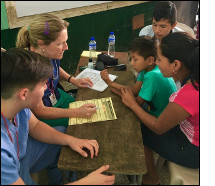 In each clinic, those of us who were not fluent in Spanish were paired with a translator- some from Guatemala, and some who had travelled with our team. My translator, Coco, was a 16 year old who hopes to begin his medical training next year. Working with him, and teaching him just a bit about practicing medicine, was an unexpected highlight of my time in Guatemala. At the end of our clinics, our team saw a total of over 2100 patients, including ~480 referrals for surgeries or other required specialty care. Additionally the dentists pulled over 680 teeth, providing relief to the mouths of many patients. Most significantly, the people we cared for we perhaps the most grateful, kind group of people I have come to know. My time in Guatemala has touched me more than I can explain, and I cannot imagine not going back next year to once again work with these wonderful people.